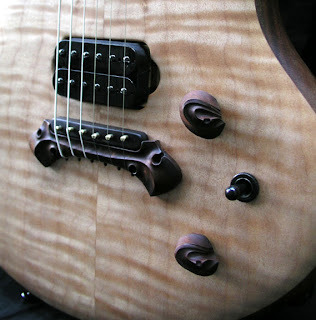 Here's another amazing guitar from W. Jeffrey Jones. This model is called Proteus. It sports the new Saturn Set that were developed in a joint effort with Jeffrey. Here's is what Jeffrey had to say about the pickups. One other defining feature of this particular instrument is the set of pickups, custom-made for this guitar by Clint Searcy of Searcy String Works. I can't say enough about them. I prefer a clean, clear pickup, especially in the neck position. The music I play myself consists of chords that are comprised of close harmonies and a pickup has to be capable of voicing those harmonies without turning them to mud. And the bridge pickup gets up and rocks when you need it. Clint never lets me down with his work. He also gave me black pole screws for an equally clean look, as well as full adjustability of all the poles spaced specifically for the string spread of the Proteus. These are incredible humbuckers that I plan on using regularly in many of my future instruments where humbuckers are called for. I can't say enough about them. They complete the whole package of this versatile guitar.